Everyone has had that moment: You are reading the local classifieds (or Craigslist nowadays) and you see an incredible deal on that used Toyota SUV you’ve been desperately looking for. But what if it’s too good to be true? Or maybe it is true? There isn’t much time…. Should you go for it? More often than not, we must evaluate machinery without ever getting to see or hear it run under power. Sometimes there is little time to make a detailed evaluation, however it is possible to get a reasonable idea of a machine’s condition without ever hearing it run. The first step is to determine whether the owner appears to take good care of his equipment in general. A clean, well organized shop is generally a good sign that the machines were handled by someone who cared about their well-being. The heart and soul of any lathe is its bed ways. 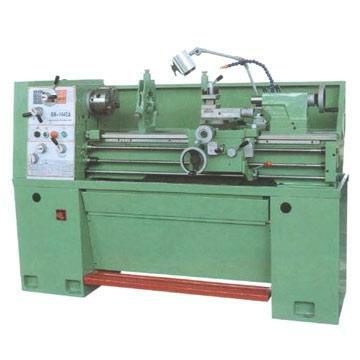 Its condition will determine the accuracy that the engine lathe will be capable of delivering. Because of this, some experts believe this has the greatest effect on the overall value of the equipment. This idea holds true for other types of machines as well. Ideally, the ways should be perfectly even and parallel, allowing the carriage to travel parallel to the axis of the spindle. The tailstock center would then be perfectly on center with the headstock spindle. Every used machine has some degree of bed wear. Your goal will be to determine the severity of the wear. Ideally, cutting a test bar between centers can be the best way to test a lathe’s accuracy. Unfortunately, circumstances seldom permit such a test. The condition of the spindle and spindle bearings is the next most important thing to check. If either is damaged or worn out beyond repair, you are looking at a costly replacement. Running the spindle is very useful to determine bearing condition, but again, this is not always possible. If you are able to run the machine, run the spindle at one of the higher speed settings for a few moments. Look for any unusual noises. Feel the bearings after the spindle has been running for some time, they should not be too hot to touch. If it’s not possible to run the spindle, it’ll be important to rely on your sense of how the bearings feel, how much slop or play is in the spindle etc. If the gears are accessible and visible, you might want to inspect them for broken, chipped, or worn teeth. If they are not accessible, the next best thing would be to listen to them run. Damaged gears can be expensive to replace. Other components you might want to check: the geartrain, gearbox and leadscrew . Also the carriage, apron, and compound. When inspecting used equipment for sale online, it can be most difficult to inspect. So, it is important to make use of some of the online tools which are available. You could ask for video of the machine running and ask that each of the areas covered above are focused on. Pictures can also help, but video is best. Using Skype or other live video chat program can also be helpful to view the machine running and be able to ask questions at the same time.